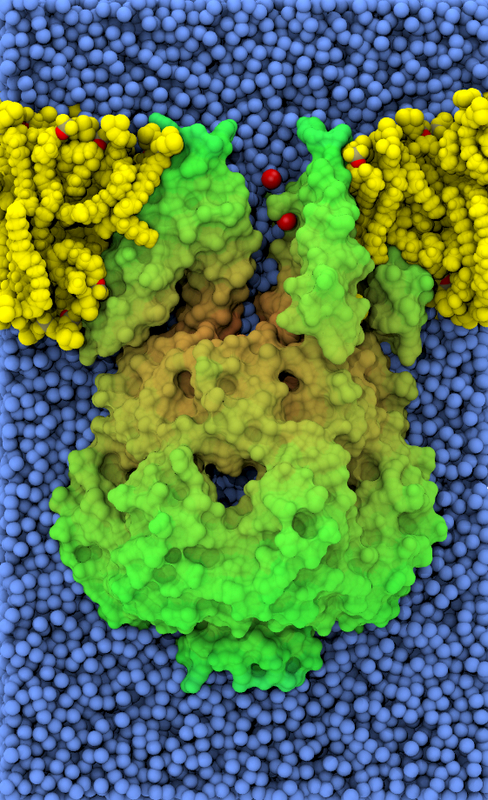 The Theoretical and Computational Biophysics Group is pleased to announce VMD version 1.8.6. 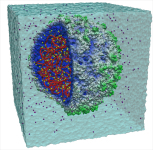 VMD provides exciting new capabilities for exporting molecular graphics to 3-D PDF files, high dynamic range images, and eerily "three dimensional" renderings using ambient occlusion lighting with production quality renderers. The MacOS X and Unix versions of VMD now benefit from far more extensive use of multiprocessor (and multicore) acceleration, greatly improving performance for several common structure analysis operations. 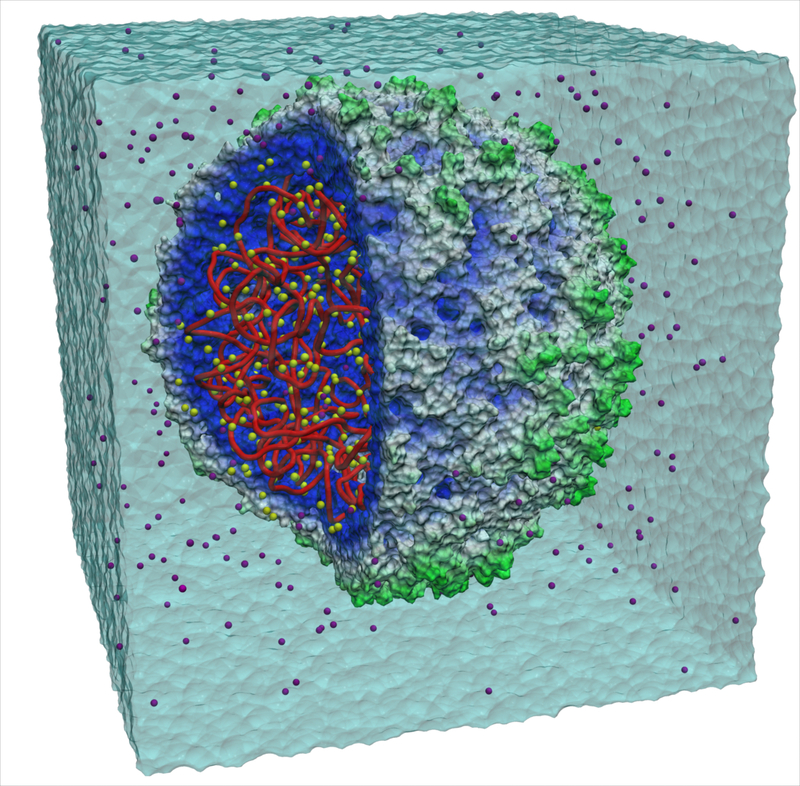 By default VMD will now use all available processor cores to accelerate parallelized portions of the code which currently include several structure analysis routines, interactive molecular dynamics, and ray tracing. 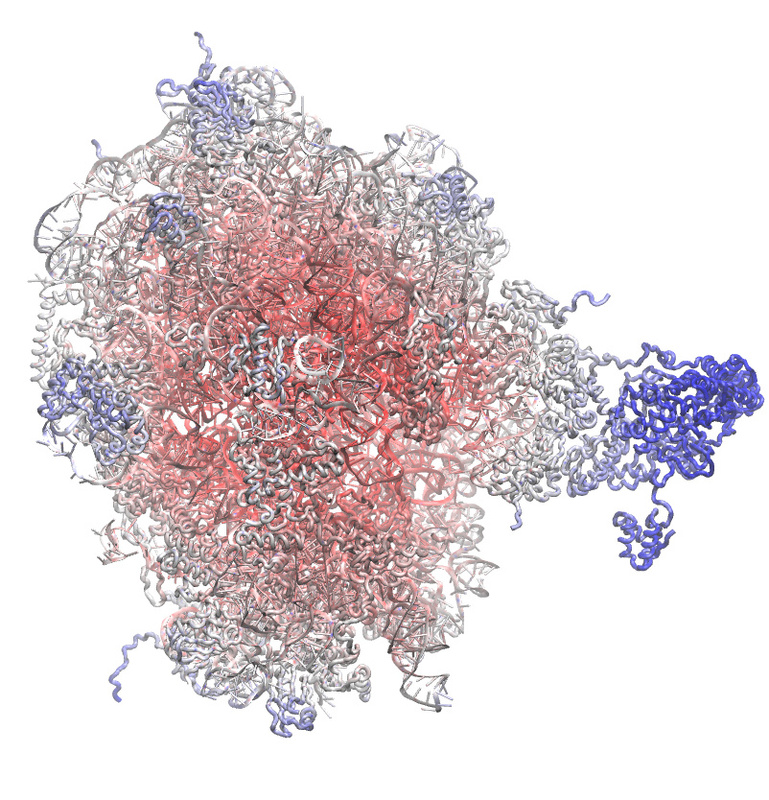 Many new and updated structure building and analysis tools have been added in this release, easing the process of setting up, running, and analyzing computer simulations of biomolecules. This release also contains many performance and efficiency improvements benefiting those loading, displaying, and analyzing large structures with millions of atoms, as well as thousands of medium sized molecules. VMD 1.8.6 includes a new rendering mode which supports scene capture with Adobe Acrobat3D, allowing researchers to create PDF documents containing 3-D scenes from VMD. The resulting PDF documents can be viewed on all popular computer platforms with the free Adobe Acrobat Reader software. VMD scenes exported to 3-D PDF files can also be imported into Microsoft PowerPoint presentations and interactively zoomed and rotated during presentations. A short VMD 3-D PDF tutorial is available, describing the 3-D capture process and suggestions to achieve good results with the currently shipping version of Acrobat3D. 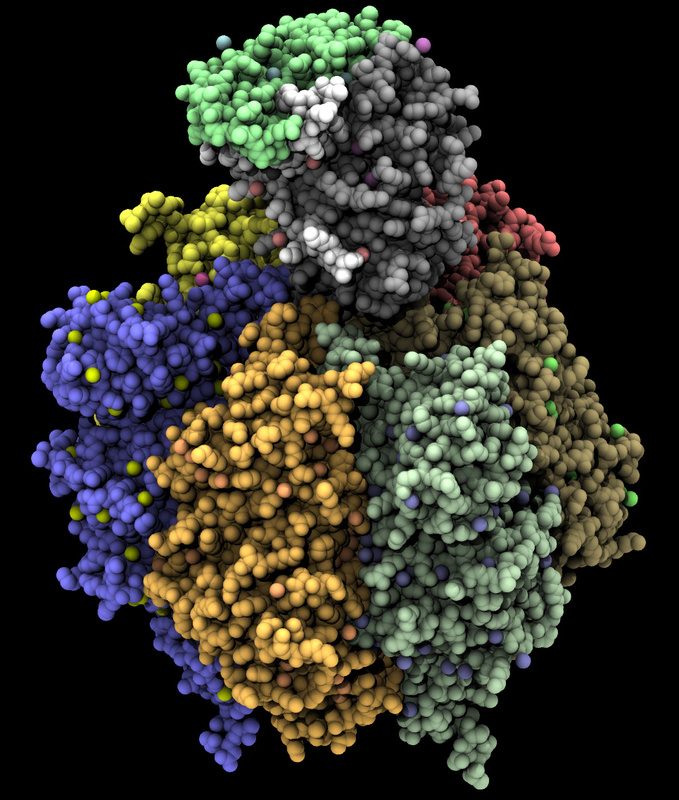 VMD now incorporates expanded support for high-quality molecular scene rendering using Tachyon, NVIDIA Gelato, and PIXAR RenderMan. These renderers support advanced lighting modes such as ambient occlusion lighting, which can be used to create molecular renderings that look more "three dimensional". These renderers also support high dynamic range lighting (HDR) and high precision color image formats. A tutorial is available, to guide users in experimenting with the use of Tachyon ambient occlusion lighting in their VMD renderings. Tachyon is compiled-into VMD and also supplied as a standalone program distributed with VMD. The included Tachyon ray tracer can be used to begin producing figures and movies using the advanced rendering features described above without installing any additional software. One of the unique advantages of VMD's support for Gelato is the ability to use GPUs to accelerate the rendering process while still supporting tremendous scene complexity and retaining the high output quality that professional software renderers are known for. A new Gelato tutorial is available. The gelato tutorial describes the new Gelato export feature and includes several early example images produced with VMD in combination with Gelato. 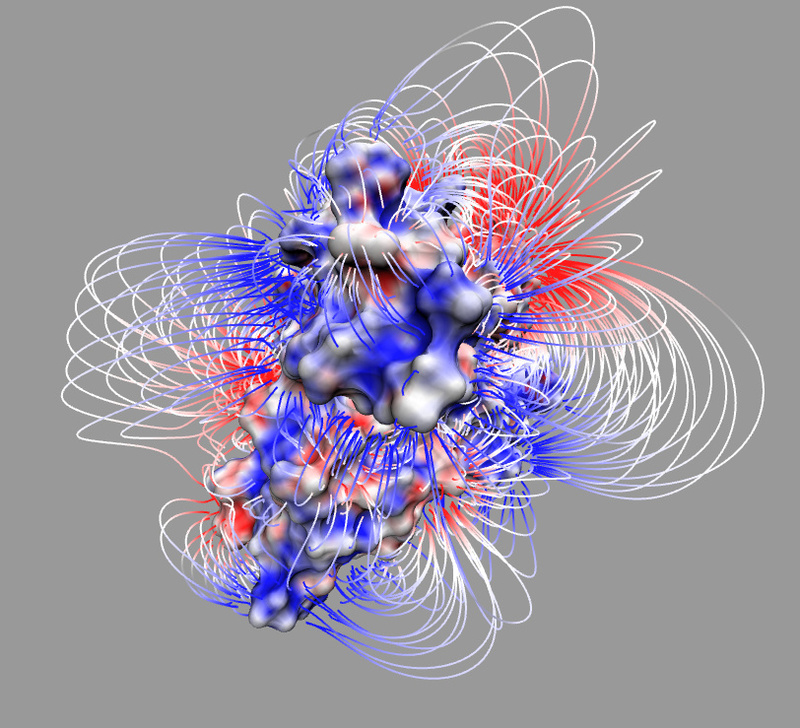 VMD includes a new "Field Lines" representation which can be used to display images of electrostatic fields, flow fields, and other volumetric data for which viewing field lines or particle advection traces is helpful. The "volmap" command in VMD now provides a Coulombic potential map averaging function which can be used to process molecular dynamics trajectories, producing a time-averaged potential field which can be used for focused NAMD simulations on substructures within a larger simulation. While not yet a standardized rendering feature, users can now easily experiment with non-photorealistic shading in VMD 1.8.6. 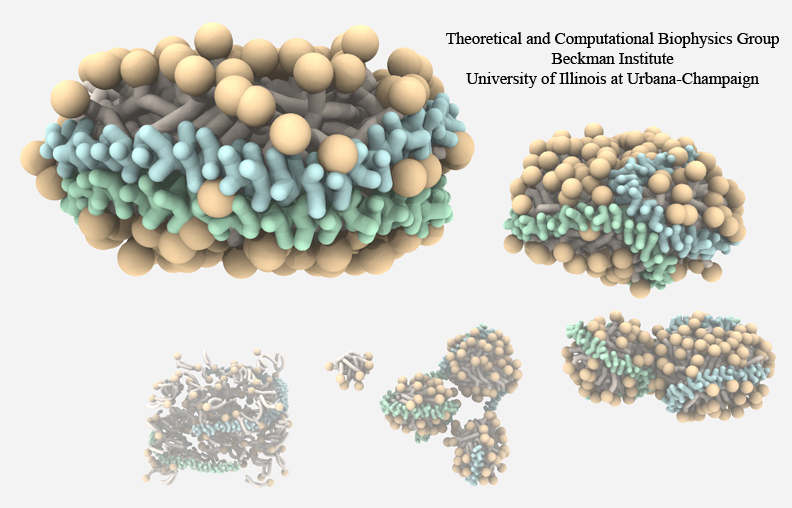 A new tutorial and example scenes show how to create VMD renderings which attempt to imitate the style of David S. Goodsell, famous for his paintings and artistic renderings of molecules. The example scene and tutorial override the standard VMD GLSL shading feature with a non-photorealistic shader that adds adjustable edge enhancement outlines which can be faded in and out with the standard diffuse shading of VMD's GLSL rendering mode. VMD 1.8.6 uses just over half as much memory relative to prior versions, allowing structures of up to 72 million atoms to be loaded and displayed on workstations with 16GB of memory, using the 64-bit versions of VMD. The reduction in memory use similarly benefits researchers loading thousands of structures at a time. 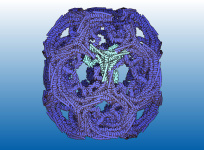 With adequate physical memory (22GB), a single text-mode instance of VMD can load and operate on the entire PDB databank (30,000+ molecules) at once. While an extreme example, this illustrates what is now possible as a result of these efficiency improvements. A new Dowser graphical interface plugin eases the process of adding solvent to RNA and DNA structures. 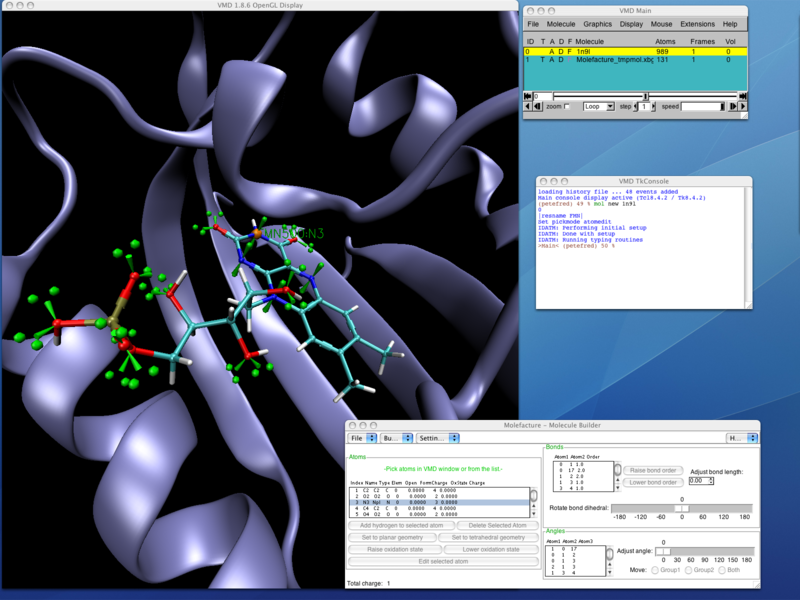 Updated versions of several existing structure building plugins provide text commands and graphical interfaces for structure building and editing, and building PSF structure files, and calculating force field parameters, and converting between all-atom and coarse grain simulation models using both shape-based and residue-based methods. 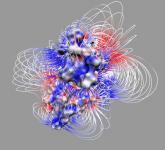 The latest version includes an easy-to-use graphical interface for animating simulations with time-varying topologies and support for several new molecule data file formats. VMD 1.8.6 is the first version of VMD to include support for GPU acceleration of non-graphical computations. VMD can be compiled to use NVIDIA CUDA to accelerate calculation of Coulombic potential maps produced by the new volmap "coulomb" map type. Since CUDA itself is still in beta and functionality and implementation details may change, VMD CUDA support is currently limited to source-based compilations. We will release fully CUDA-enabled binaries of VMD concurrently with the official NVIDIA CUDA product announcement. Subsequent releases of VMD will benefit from more extensive application of GPU acceleration to several of the most time consuming trajectory analysis commands in VMD. Contact Us // Material on this page is copyrighted; contact Webmaster for more information. // Document last modified on 05 Feb 2011 // 78594 accesses since 17 Oct 2006 .